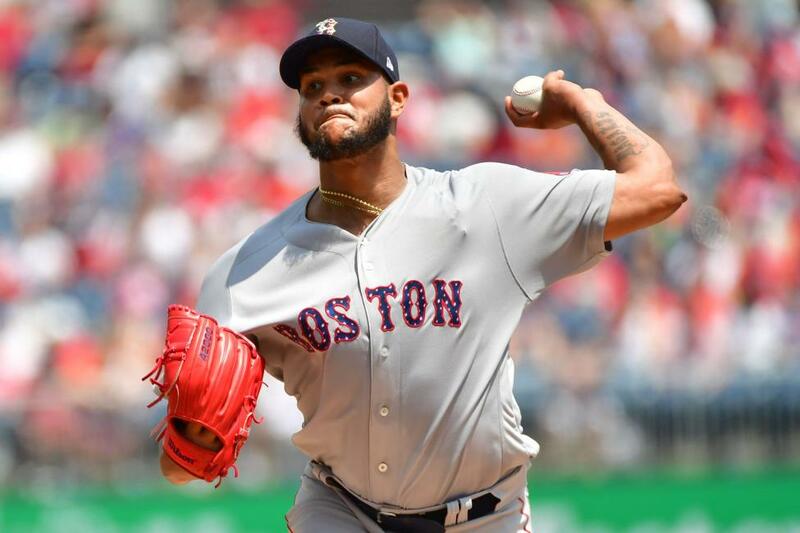 Having reached 100 victories for the first time in more than seven decades, the Boston Red Sox send Eduardo Rodriguez to the mound hoping to sweep their three-game series with the Toronto Blue Jays on Thursday night at Fenway Park. With David Price turning in another masterful performance and the only run of the game scoring on a wild pitch, the Red Sox won 1-0 Wednesday night to reach 100 wins for the first time since 1946 -- and only the fourth time in franchise history. Rodriguez will face Sam Gaviglio as the Red Sox look to take their 15th win in 19 tries against the Blue Jays this season. --Alex Cora became the first manager to lead a team to 100 or more wins in his first season with the club since Felipe Alou (2003 Giants, 100-61) and the first manager to lead a team to 100 wins in his first year as an major-league manager since Dusty Baker (1993 Giants, 103-59). --Cora became the second Red Sox manager to lead the team to 100 wins in his first season with Boston, joining Jake Stahl (105-47 in 1912). The franchise record, set in 1912, is 105 wins. After Thursday, the Red Sox will face New York teams for six games, hosting the Mets over the weekend and visiting the Yankees next week. But first it's another game with the Jays, who have won only once at Fenway this season. Price pitched seven shutout innings to improve to 15-6 and remains unbeaten -- and very tough to hit -- since the All-Star break. "The goal is to win the World Series," Cora said. "Since day one we've talked about it here. I still remember that press conference. Obviously, we've got a shot now." With the New York Yankees losing again in Minneapolis, the Red Sox's magic number for clinching their third straight American League East crown is seven. The magic number to clinch the best record is nine. Price, who went 9-1 to help the Blue Jays into the 2015 postseason, improved to 21-3 lifetime against Toronto. Aaron Sanchez pitched very well for the visitors, but lost the game on that wild pitch. "He had a real good fastball, he threw some good breaking balls he kept down in the zone and he threw some good changeups," Blue Jays manager John Gibbons said. "You hate to lose on a wild pitch, but that's what happened. But he keeps moving in the right direction." Rodriguez (12-4, 3.64 ERA) lost his last start, allowing five runs and six hits -- including two homers -- in 3 1/3 innings against Houston. He is 3-3 with a 4.63 ERA in 11 games (10 starts) in his career against Toronto, but 2-0, 2.41 in three starts this year. Gaviglio comes in 3-8 with a 5.25 ERA, but one of the wins was against Boston, in relief. This will be his fifth appearance of the season against the Red Sox, the third straight start. He is 1-1 with a 3.95 ERA in his four games against the Red Sox this season and is 0-1 with a 4.82 ERA in two starts at Fenway. J.D. Martinez has two hits in eight at-bats against Gaviglio, but both hits are home runs. The Red Sox said Wednesday that Chris Sale, who came off the disabled list and pitched an inning -- 26 pitches, two strikeouts -- Tuesday, felt fine the day after. That had been a problem in his two previous games. He will shoot for three innings Sunday against the Mets.